Marriage is an exciting time in a couple’s life. But meshing the two lives together can sometimes be tricky to do, especially when it comes to money. If you haven’t had an honest chat about your finances, you want to schedule a time to discuss your investments. Communicating your plans for the future will allow you to obtain marital peace and financial bliss. If you’re into investing, making a great yield is the primary outcome for most individuals. But it can take due diligence to master this task. If you’re getting married, you want have a discussion with your partner about their money attitudes. This includes spending habits, budgets, ways they save money and investments. You should also discuss goals for your future retirement and ways that you will go about saving money. Once you’ve implemented a plan, put it in writing to help both parties stay within the parameters that you’ve set. Discussing goals and future expectations are a small part of the investment equation. You also want to have a clear picture of how much your loved one earns and total assets. This should then be compared to their debt. This could include college loans, credit cards and business lines of credit. If you find yourself needing a working capital loan, the additional money can be a great way to pay for your company’s payroll or special business projects when money is tight. A person’s credit rating is another important factor when it comes to money. Although an imperfect credit report may not hinder you from obtaining a working capital loan, the blemishes could become a problem if you’re looking to purchase a home. Discussing debt ahead of time before marriage allows you to see where each person stands financially. As more couples marry later on in life, it can be challenging to release financial control to a partner. But it’s not a bad thing to keep separate bank accounts after you get married. As a matter of fact, it can even save a lot of future headaches when each party handles their own accounts. A joint account should be opened after you get married to handle household expenses. 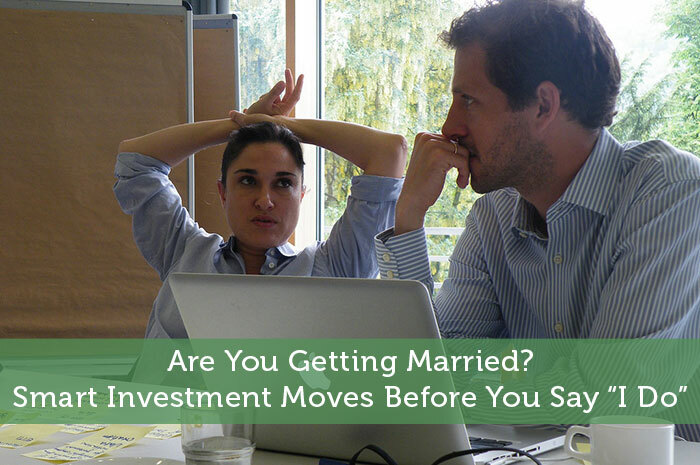 Your risk tolerance may be different than your soon-to-be spouse. Before you get married, it can help to have a meeting with your financial advisor for an overview of your accounts. Before you blend accounts that are used for investing, you want to factor in the other person’s tolerance for risk. Set aside some money for your riskier investments and keep a substantial portion for those that are safer, especially in a downturn economy. Schedule periodic meetings with your advisor, so both parties understand your financial outlook. You don’t want to go into a marriage set up for failure. But putting together a prenuptial agreement ahead of time can be a lifesaver if you end up getting divorced. The document should state the assets and expenses that each party will walk away with in the event that that marriage dissolves. This can be especially beneficial if one party comes into the marriage with more assets than the other. A knowledgeable attorney experienced with prenuptial agreements will be able to draw up the document for both parties to sign before the actual nuptials. Falling in love and making the commitment to marry can be a wonderful part of life. But in order to give your marriage a chance at working out, you want to find a way to mesh your finances and investments. The above tips will allow you to open the doors to communication and plan for a more secure future together. These are all good tips, but bringing up the Prenup conversation has got to be awkward!